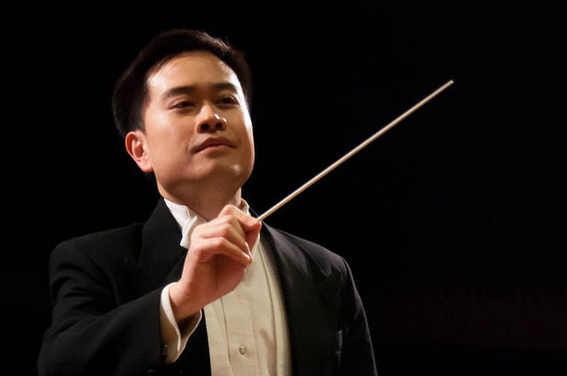 American orchestra and opera conductor Channing Yu is Music Director of the Mercury Orchestra in Cambridge, Massachusetts and Associate Artistic Director of the Refugee Orchestra Project in New York City. He is the national winner of the 2010 American Prize in Orchestral Conducting in the community orchestra division. He recently served as Music Director of the Dudley Orchestra in Cambridge, Massachusetts; Music Diretor of Bay Colony Brass in Watertown, Massachusetts; Leader of the Powers Community String Orchestra in Belmont, Massachusetts; and Conductor of the Massachusetts Youth Symphony Project Preparatory String Orchestra in Belmont, Massachusetts. He has also served as Artistic Director and Conductor of the Lowell House Opera, the oldest opera company in New England, where he conducted over thirty fully staged performances with orchestra, including Tchaikovsky’s Eugene Onegin, Richard Strauss’s Der Rosenkavalier, Puccini’s Turandot, Verdi’s Otello, and Puccini’s Tosca. For his musical direction of Tosca, he was awarded second prize in the 2011 American Prize in Opera Conducting national competition. He served as guest conductor at the University of North Carolina, Charlotte, in its production of Marc-Antoine Charpentier’s baroque opera Les arts florissants. He was guest conductor of Atrium Winds in Jamaica Plain, Massachusetts. He was also invited to guest conduct the Westmoreland Symphony Orchestra in Greensburg, Pennsylvania. He began formal study of conducting at Harvard University with James Yannatos; there he served as assistant conductor of the Harvard-Radcliffe Orchestra and conductor of the Toscanini Chamber Orchestra. Since then, he has worked with a number of conductor teachers in the master class setting, including Kenneth Kiesler, Roberto Paternostro, Diane Wittry, Charles Peltz, and Frank Battisti. He was invited as one of fourteen conductors worldwide to work with conductors Neeme Järvi, Leonid Grin, and Paavo Järvi in master classes at the Leigo Lakes Music Days Festival in Estonia. He worked with George Pehlivanian conducting L’Ensemble Orchestral de València in Spain, with Johannes Schlaefli conducting the Plovdiv Philharmonic Orchestra in Bulgaria, and with Sandro Gorli conducting the Divertimento Ensemble in Italy. Channing Yu grew up in Pennsylvania. Originally trained as a pianist, he was a divisional grand prize winner of the American Music Scholarship Association International Piano Competition, and he has appeared as piano soloist with numerous orchestras including the Pittsburgh Symphony Orchestra, Westmoreland Symphony Orchestra, Dayton Philharmonic Orchestra, and Orchèstra Nova. He has been praised by Anthony Tomassini of The Boston Globe for his “imaginative piano work.” He performs with the chamber ensemble sul ponticello in Cambridge, MA. As a violinist, he has served as concertmaster of the Brahms Society Orchestra and as violinist in the Boston Philharmonic Orchestra, and currently performs as concertmaster of the Greenwich Village Orchestra and as violinist and violist with Camerata Notturna in New York City. He was a founding member of the string quartet Quartetto Periodico, and he was first violinist in the Kitchen Quartet, which was featured as the Quartet in Residence at the Three Rivers Arts Festival in Pittsburgh, Pennsylvania. As a lyric baritone, he has performed recently with New Jersey Verismo Opera and previously with the Boston Opera Collaborative and in the Neil Semer Vocal Institute in Coesfeld and Aub, Germany. He has also sung with the Tanglewood Festival Chorus, the Grammy award-winning chorus of the Boston Symphony Orchestra and the Boston Pops. He is a former faculty member of the Powers Music School in Belmont, Massachusetts.